Sieves should be cleaned after each analysis and replaced in their storage containers. Most of the "near mesh size" particles which block the apertures can usually be removed by inverting the sieve and gently taping the frame. If this fails, the underside of the mesh may be stroked gently with an Endecotts sieve brush specially designed for use on test sieves with apertures over 1 mm. For sieves with smaller apertures and almost any other application the most efficacious method is the use of an Ultrasonic cleaner. 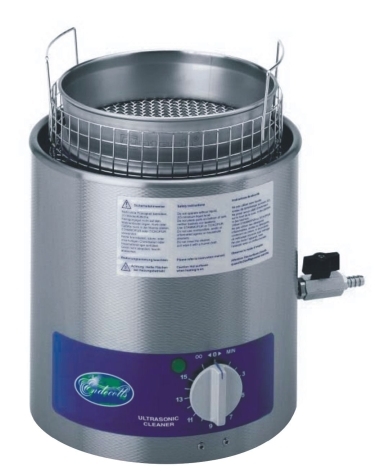 Endecotts Ultrasonic cleaner has been specially designed for cleaning test sieves and is also suitable for general laboratory use. It is easy to operate and extremely efficient to use. The all stainless steel construction and digital control panel are ergonomically designed to give a long trouble free life. Endecotts Ultrasonic cleaner is environmentally friendly, operating on 10.5 litres of organic solvent free water. It is equipped with 4 high frequency 30 - 40 khg transducers, rear mounted for optimum performance. A sieve up to 200 mm or 8" in diameter is placed on a special sieve holder. This presents the sieve at the ideal angle to the transducers as well as allowing contaminants to fall free of the sieve onto a catch tray. Simply emptying the tray reduces the need to change the fluid. Power: 230 V 50HZ. Other voltages & frequencies on request.